When counterfeit bills appear in the capital city of the Song Dynasty, a government department known as The Six Panels appoints an undercover agent, Coldblood, to infiltrate a special force called The Divine Constabulary to sabotage their investigations. 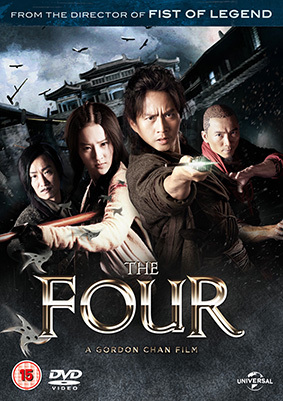 The first feature film adaptation of Wen Ruian’s novel series The Four Great Constables (Si Da Ming Bu), The Four is set in a world where magic, action and mystery reign, and where superheroes with fantastic powers wage war on armies of the undead in increasingly spectacular battles. It's a classic Wuxia with a supernatural twist from Gordon Chan, the acclaimed director of King of Beggars, Beast Cops and Fist of Legend. The Four will be released on UK DVD on 9th September 2013 by Universal Pictures UK at the RRP of £12.99. Here's the original Chinese teaser trailer, sans subs I'm afraid.